The co-partner of Turkey’s global Nusr-et chain of grill houses, Nusret Gökçe, who recently became a social media phenomenon for his meat-cutting and salt-drizzling skills, has taken role in the famous TV series Narcos, which tells the life of Columbian drug lord Pablo Escobar. 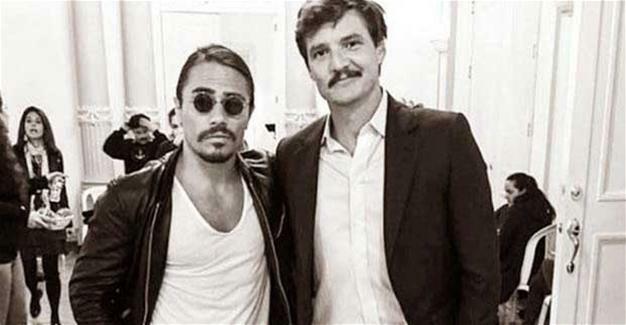 Gökçe shared a photo of him with Pedro Pascal, the lead actor of the series, on his official Twitter account. Gökçe travelled to Colombia’s capital Bogota to star as a guest actor in one episode. He played a role that is very familiar to him in the episode, in which he serves meat at a restaurant.